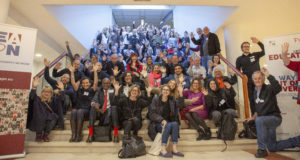 On 7 and 8 November, the 17th European Meeting of People Experiencing Poverty took place. 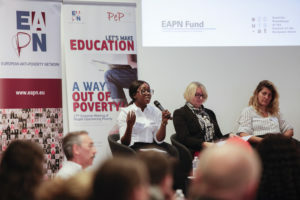 It was organised by the European Anti-Poverty Network with support from the European Commission and the EAPN Fund. This year’s Meeting of People experiencing Poverty was on Poverty & Access to Education. Over a hundred people experiencing poverty from 32 European countries shared their knowledge and experience with each other, and with EU decision-makers. For EAPN, education is a state of being ready for continuous learning, and ready for life. It is a fundamental right that should be accessible to all and not solely seen as a means to access the labour market. This resulted in a very rich, inspiring meeting and powerful key messages! There were 2 panel debates including the following speakers: Vera Hinterdorfer, EAPN vice-president, Katarina Ivanković Knežević, Director for Social Affairs at the European Commission’s DG Employment, Social Affairs and Inclusion, Florian Pecenka, Department for Education, Science and Research at Permanent Representation of Austria to the EU, Michael Teutsch, Head of Unit for Schools and Multilingualism of the European Commission’s DG Education and Culture and Guy Vanhengel, Brussels Minister of Finance and Budget. Delegates shared their stories and discussed with the policy makers the further steps to be taken in order to have better policies and to fight against poverty and social exclusion. To emphasize their messages and the need for real participation, the participants organized a collective action on Thursday 8 November. They gathered in front of Brussels’ Central Station for a ‘freeze flashmob’. The flashmob put to light poverty issues and put people experiencing poverty throughout Europe forward as super-heroes fighting against poverty. Participants prepared statements related to this topic and kept a freeze position for two minutes, showing their messages. We truly hope (and appeal to all stakeholders, especially national and EU level decision makers) that the messages will indeed be heard. 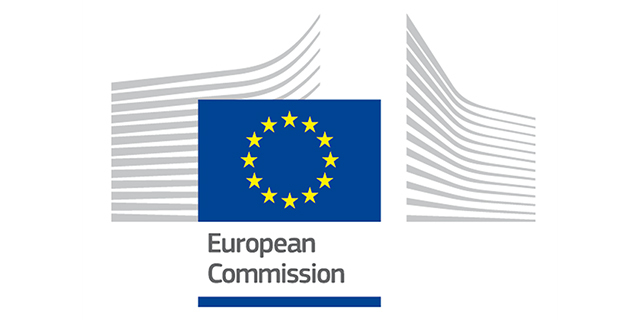 We call upon the EU Institutions and national governments to show strong commitment to the fight against poverty and to ensure impact and tangible progress in access to education. The full report of the meeting will be soon available.